Did you miss out on last weekend’s free trial of Star Wars: The Old Republic? Well never fear, Bioware is offering another Weekend Pass starting Thursday, March 22nd at 12:01 am CST through Monday the 28th of March at 2:00 am CST. 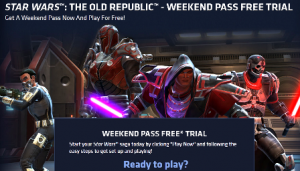 This offer is for anyone who did not take part or get the opportunity to try SWTOR during the last Weekend Pass trial. For more information on downloading and eligibility check out the official Weekend Pass article. Bioware released another announcement that gives people a chance to experience Star Wars: The Old Republic for free. This trial period, March 15th at 12:01am CST through Monday, March 19th at 2:00am CST, starts the Weekend Pass program. So invite that friend who has yet to try SWTOR, turn the TV on let the announcers keep you up to date on the NCAA scores, and enjoy the whole weekend gaming. SWTOR is one game where the only upset is when you have to logoff. 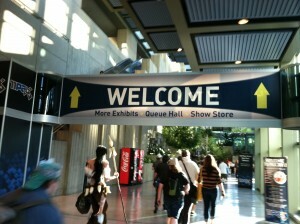 We had a blast at PAX Prime. We got to chat with the devs, hang out with other people who have been following the game, play a little Huttball. All in all, a very fun weekend. For those hoping for brand new content, the pickings were a little slim, but we did get bits of info here and there that help expand our understanding of the game. The new information has been highlighted in gold. Probably not a launch, but on the wall of crazy.